Starting a business is exciting, terrifying, fun, sleep depriving, and most of all - it is all you can think about. It's your baby. It's your life. Man, was that the truth for me when I started, what was then, Bee Social. I went to school for marketing and management and have worked in marketing my entire adult life, but always on the client side. After realizing that my age was actually hurting my credibility with vendors and even with my superiors - because no one could believe that a 20-something actually knew more than them - I decided that I was going to make my own path and started my marketing agency. Throughout this four year (so far) journey, I've learned a lot about myself, my agency, and about running a small business. Here are some of my biggest takeaways. I hope they help someone out there avoid some of the mistakes that I made early on. Man is this one a big one! As you start a new business, you're really less focused on good fit clients and more focused on signing any client - good or bad - because you have bills to pay. Let's be honest - when we started Bee Social, we hadn't even considered what a "good fit" client actually was. At the time, anyone that wanted to pay us was a good fit because they had a business and wanted to pay us. Of course, as a brand new business, you have to start working with any client that will have you because you need to build a reputation, case studies, and well, you have to eat. That's something we absolutely did. We brought on clients that were paying next to nothing because we were focused on proving to the community that we knew what we were doing and could help them. No one likes being the first or only client. It's not a good or secure feeling. We worked with some of the best people that I've ever met in my life, but looking back now, we were likely losing money working with them because they were paying such low rates and they really weren't good fits for our marketing agency. 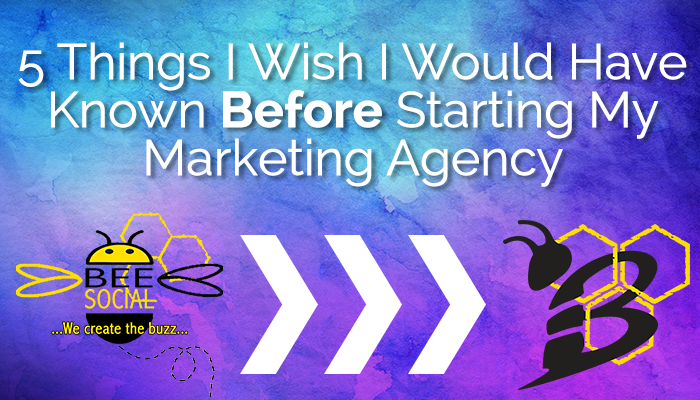 I remember at the end of our first year in business as we were starting to grow and really starting to figure out (well...kind of) how to run the agency, my good friend and, at the time, a trusted consultant for Bee Social, Amber, told me - "fire them," referring to a bad fit client that was taking far too much time and requesting work that was completely out of scope. I was completely taken aback. Fire a client? That's not a thing! I need the money. Amber had realized something, coming from a larger and more established agency, that I couldn't yet see - that not every client is a good client. As we were starting up, the "N" word never came out of my mouth. We were a "Yes" only agency. Which was a major problem, but lucky for me, I learned early that saying no is very empowering. Towards the end of our first year, we had just signed our biggest client ever. It was a medical client that had signed a large (at the time) retainer to have us work with them on their website, marketing, and design. It was so exciting to sign them and we couldn't wait to get started. As soon as we got the first check from them, the owner of this company showed his true colors. He immediately requested items out of scope, treated my team terribly, and even insulted me. I was shocked and had to make a decision. I had to say no. As he started to go off on one of his rants, I cut him off and said, "We can not work with you. I'm sending your check back and cancelling your contract with us." It was equal parts exhilarating and terrifying. I had just turned away the biggest client that I'd ever worked with, before really even working with them. The lesson here was that saying no is a powerful thing. I like to think that saying no then has set us up to be successful now. We are much more comfortable saying no and turning away business now if the client is not a good fit for us - or you know - a jerk. Like I talked about earlier, in the early days of a start up, you're really just focused on selling something, anything for any amount. You just need sales. Well, that is fine when you're first starting out, but you need a plan. Taking on clients early for lower prices than you should is a fine strategy because you need clients, need to prove your value, and you have bills to pay, but doing so without a clear timeline and a true understanding of what your time and efforts are worth is the problem. Understanding what your work is actually worth is a really hard thing to get your head around. I had worked as a freelance graphic designer while at my last job for some extra cash and because I loved it. I charged $30/hour for my time. I thought that was great! I had never made $30/hour at any job before and to get that for doing something I loved doing was fantastic. When I started my marketing agency, I didn't factor in overhead, software, and other expenses that were necessary to keep the business running. Of course, I didn't charge $30/hour, but my costs were still vastly lower than what they should have been and what competitors were charging and I had no real plan to get out of that rut. I actually had a client tell me, after signing with us, that they hired us because we were so much cheaper than everyone else. That was a major red flag and not a good feeling. I think one of the greatest pieces of advice that I've received was from a dear friend and owner of Code Blue Computing, Jeri Morgan. She told me that my prices were too low (which I knew, but didn't know how to change). She then told me, "No one will ever pay your rates unless you first believe that you're worth it." That hit me like a Brinks truck. I first had to get comfortable with a higher rate and had to confidently demand those rates before someone would actually pay them. I had to be willing to walk away if someone wasn't willing to pay what I was charging, instead of lowering my prices just to gain a new client. Such a huge insight came from that single sentence from Jeri. Thank you, Jeri. Getting into business with friends is tough. All partners have to have the same drive, passion for the business, and willingness to do whatever is needed to make the business successful. Some people are not meant to be entrepreneurs. Others won't have the same unwavering passion for the business that you do. And others still just aren't willing to live the life of a startup. All of this is fine, but you need to identify these things before going into business with them. My advice here is to be honest, open, and blunt when necessary about what you expect and need from your partnership. Partnerships can be amazing, but they can also go down in flames. Take the time to really understand what life would be like with this person as your partner, because it really is like a marriage. Things are guaranteed to change. No matter how much research you've done or how sure you are that your original business model is perfect, things will constantly change and sometimes change dramatically. Bee Social was meant to be strictly a social media agency, but we soon learned that we would need to evolve and be much more than that. Fast forward four years and now, HIVE Digital Strategy is a full service inbound marketing agency and very close to becoming a Gold HubSpot Partner Agency. This was never in our plans. We didn't ever expect to be what we are now, but without being willing to change and evolve, our doors would have been closed years ago. We have undergone a complete transformation and gone through a lot of education to be able to provide our clients with great inbound marketing strategies and execution. Social media is only a small piece of what we do now. Don't avoid or resist the change. The best companies evolve and do so by understanding the need in the market. Do you think Steve Jobs thought that Apple would become a leader in smart phones back in 1976? Of course not. They evolved and became the tech giant that they are today. So there you have it. I've pulled back the curtain a bit to let you see some of the early struggles that we have overcome in the past four years. Now it's on to the next set of struggles and changes for the next four years - and I can't wait! Like we just talked about, being flexible and having a plan are very important pieces to any new business. The same is true when you're ready to start marketing your company online. It all starts with a great digital marketing plan. That's where the HIVE GrowthPlan comes in. It's a full, personalized, and actionable digital marketing game plan to help you be successful and have a good return on investment as soon as possible.